The son of Sen. Bernie Sanders (I., Vt.) on Monday officially launched his campaign for Congress in New Hampshire's first congressional district. 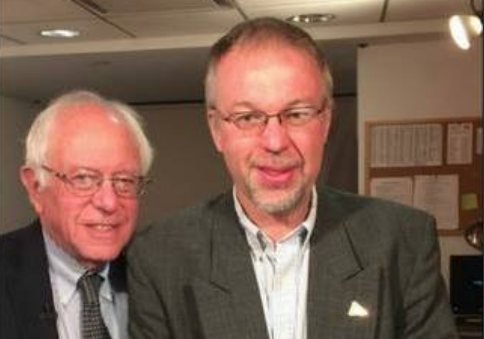 Levi Sanders, the senator's only biological child, told ABC affiliate WMUR that he has entered the House race as a Democrat. "After much thought and consultation with my family, friends, and the people of New Hampshire, I am excited to announce today that I am running for Congress in New Hampshire's first district," he said in a statement. Sanders, 48, is the eighth Democrat to enter the congressional race to replace Democratic Rep. Carol Shea-Porter (N.H.), who currently holds the seat but announced in October that she will not seek reelection in 2018. Sanders, who does not live in the district, says his 17-year career as a legal services analyst in neighboring Massachusetts has prepared him to effectively represent New Hampshire's "working class, who have been beaten up by the system." He plans to run on a platform similar to that of his father, emphasizing universal health care, free college tuition, and a higher minimum wage. "We need a Medicare For All health care system which guarantees health care to every man, women, and child without out of pocket expenses," Sanders' campaign website says. "We need an educational system which says that whether you are rich or poor, you have the ability to go to a public college and/or university tuition-free," the website continues. "We need to demand that we have a minimum wage which allows people to work forty hours a week without being in poverty." Sanders also plans to address the opioid epidemic, which he says is "at a crisis level in New Hampshire." Levi Sanders is not the only relative of Bernie Sanders angling to be on the ballot this November. The senator's stepdaughter, Carina Driscoll, announced her intention to run for mayor of Burlington, Vermont, the city that launched Bernie Sanders' political career. New Hampshire's first congressional district has been a prime battleground between Republicans and Democrats since 2006. Donald Trump won the district, which is marginally Republican on paper, in the 2016 presidential election after Barack Obama won it in 2012. This entry was posted in Politics and tagged 2018 Election, Bernie Sanders, Democratic Party, House of Representatives, New Hampshire. Bookmark the permalink.